Dana Loia's DIY macaron kits banish the intimidation factor of baking these exquisite French treats. The macaron: Light as a feather, pretty as a picture, melt-in-the-mouth tender, in an infinitely expanding universe of delectable flavors and colors....................[Editor's note: Excuse us. Writer was overcome by macaron cravings.] Making these almond meringue-based cookies with a creamy center can be a little intimidating for the home baker. Photo editor-turned pastry chef Dana Loia's American-flavor macaron kits make it easy and fun. Fudgy Chocolate Moltens, inspired by Dana's favorite cake, have a milk chocolate shell filled with dark chocolate ganache and a rich molten center. Fruity Cereal Macaron is the colorful childhood breakfast favorite, all grown up. 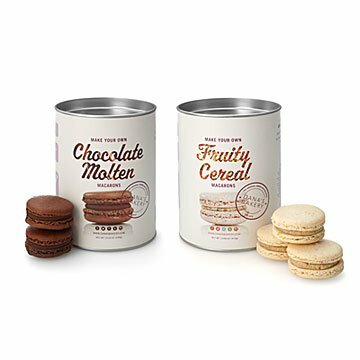 The kit contains all the equipment and dry ingredients needed to make 20 delicious macarons in each flavor, plus simple instructions and recipes. Impress your guests, if you manage to have any left by the time they arrive. Made in North Carolina. Each kit makes approximately 20 2" macarons. My boyfriend got this kit as a gift for me. We were really excited to make our own macaroons as we love macaroons and enjoy cooking together. Unfortunately, this kit doesn't have much to enjoy. My first disappointment was that we need to buy so many things: eggs, whipped cream, chocolate. The kit itself is expensive and for some reason has ingredients for 20(!) macaroons. And there is no way to split the mix for two times. We also messed up something and our macaroons were not pretty or delicious, the only amazing thing was chocolate ganache, which we made with a different recipe from the internet with ingredients we bought separately. I hoped to enjoy making and eating these macaroons with my boyfriend. Instead, we argued while making these and wished we just bought macaroons for the same money. Bought this for my wife as a Christmas present, it comes with two ingredients- in order to use the kit, you need another 6 or 7 ingredients: egg whites, whipping cream, vanilla, etc. a bunch more. Very disappointed.